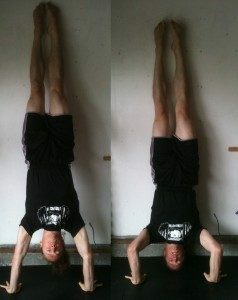 Warmup before you start with handstands no matter if you are an elite athlete that has mastered this technique. Do arm swings, regular pushups and roll your wrist in a circular manner. Onnit Alpha Brain has been clinically studied to help healthy individuals support memory, focus, and processing speed. Start out slow and work your way up. I learned by putting my feet on a higher bench and doing pushups. I added a box on top of the bench and that made my feet go higher. When I lowered down I dipped my chin in and touched the top of my head. Eventually I was able to kick up and hold my feet up high on the wall for five seconds. I put a thick mat under my head in case I fell. if you cannot do handstand pushups then put your feet on a bench. If you cannot do pull-ups then do jumping pull ups. Question: What is a deficit HSPU? Answer: That is where the floor is lower than your hands. An example would be to put your hands on a thick 45 lb rubber bumper plate. When you lower down your head is lower than you hands. If you want to add more height then add an extra bumper as needed. Check out the photo above for a demonstration. Try A Free Bottle of Onnit New Mood. Better Sleep, Better Mood, Better You! Question: My hands keep getting ripped when I do kipping pull-ups during CrossFit workouts. 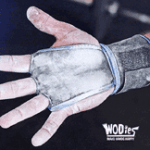 Answer: I would recommend a CrossFit wrap like the WODies by JerkFit . You will see beginner and elite athletes using these gloves to protect their hands. Question: Where can I learn more about CrossFit? QUESTION: Coach, what do you like to add to your workout shakes? ANSWER: I use Athletic Greens in our shakes. It’s got tons of great nutrition—vitamins and minerals. Plus it mixes up easy in milk or water. Do you have any tips for the HSPU? Frank – check out the tips above. My favorite is to just put my feet against a wall and hold myself up as long as i can. Having trouble getting feet on the wall it’s more of a mental block than anything. Any advice? Put your feet on a bench higher than your hands and head. Do a pushup. Once you are comfortable with that height then raise the bench and bring your hands in closer. Repeat. Eventually you work up to where your hands will be only a foot away and your feet up high and you will have the ability to put your feet against the wall.